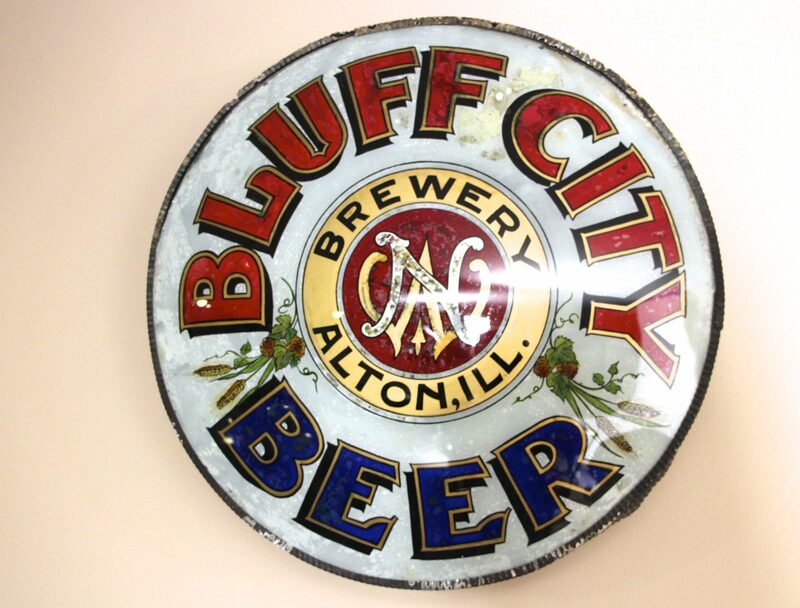 This is a Reverse-on-Glass corner sign from the Bluff City Brewery in Alton, Illinois circa 1890. It has a vibrant seven-color design. It brilliantly reflects the red, blue, green, gold, brown and black colors on a white glass background. The image highlights the name Bluff City Beer made by the Bluff City Brewery based in Alton, Illinois. 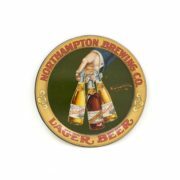 The center of the design features the initials WN, representing the brewery owner William (Wilhelm) Netzhammer. 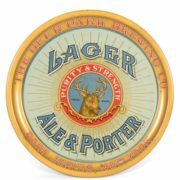 On each side of the sign’s illustration are a couple sprigs of barley and hop cones. 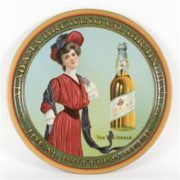 The image on this sign is Reverse-on-Glass, a process that incorporated the painted advertising design on the backside of the glass. This round-shaped sign measures 16 inches in diameter. It has a serrated metal one-inch frame around the outer edge. The backside of the sign has a wood frame shaped at a 90-degree angle designed to hang on the corner of an outdoor building or saloon. 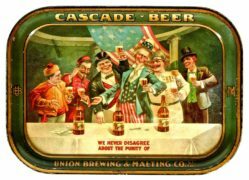 This Pre-Prohibition sign is considered very rare. The Bluff City Brewery was located in Alton, Illinois within Madison County that is part of the St. Louis Metropolitan area. It was in business from 1881 through 1952. William (Wilhelm) Netzhammer purchased the brewery in 1883. Netzhammer was the son of a brewer and he worked as a brew master and brewery foreman for several breweries before heading to Alton, Illinois with an opportunity to run his own brewery. The Bluff City Brewery flourished under Netzhammer’s management. He added new buildings and installed innovative machinery to manufacture ice to cool ice storage cellars and for retail sales. The Bluff City Brewery produced Bluff City Select, Special Brew, Bock and Bohemian brands of beer. 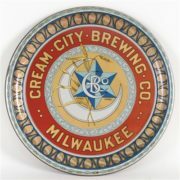 The Bluff City Brewery remained in business until 1952. Today, some smaller buildings of the brewery still remain including the bottling company building and the brewery owner’s house. 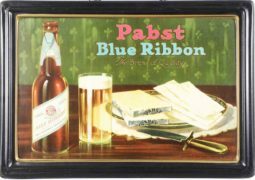 Bluff City Beer Breweriana collectibles found today include vintage beer bottles, tin signs, reverse-on-glass signs, lighted signs, neon signs, corner signs, Vitrolite signs, porcelain signs and brewery boxes. 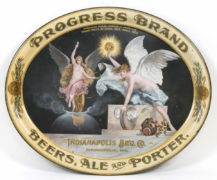 Brewery corner signs were popular in the late 1800’s and early 1900’s. The backside of the corner signs were shaped with a 90-degree angle frame designed to fit on the edge of a building, usually where two walls would meet. These semi-permanent outdoor signs were often positioned in pairs across from each other on opposite corners of the front of the business. Many of the corner signs were curve-shaped and allowed them to fit even more snug around the buildings. 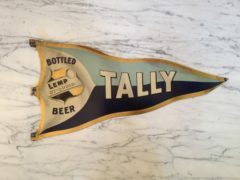 The most common usage of corner signs was for breweries to advertise their beer brands outside of saloons. However, other types of merchants utilized corner signs to advertise their products outside general stores or buildings. Today, corner signs are typically difficult to locate because most did not survive due to glass breakage or the metal being used in another manner. The metal drives during World War II recycled metal from signs to help build mortar shells, tanks and other materials for the war effort. 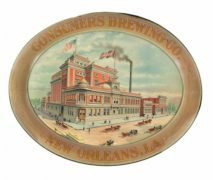 Corner signs are considered rare and valuable and are sought after by many antique advertising collectors.